When a female (who may or may not have been walking her bicycle) was hit and killed by a bus on Slauson in South L.A. last month, I got a few phone calls from friends in the area. I was surprised they had heard about it. But perhaps I shouldn’t have been. It feels like more mainstream attention is being given to incidents on the road that result in the death or serious injury of pedestrians and cyclists of late, and it actually feels like people are paying attention. Or, at least starting to see these preventable tragedies — particularly hit-and-runs — as a problem. It has been incredibly heartening, for example, to see KTLA take an interest in ghost bikes (and the work of the activists who put up the memorials) and show up yesterday to cover the Ride for Justice for Andy Garcia. Garcia was the young man killed in a hit-and-run last September when an intoxicated 21-year-old named Wendy Villegas slammed into him and dragged his bike under her car several hundred feet up the Cesar Chavez bridge. KTLA met the riders at the starting point in Bell Gardens, interviewed Garcia’s mother, Carmen Tellez, who was riding with the group, and then stayed to cover the hearing. Their presence was also an opportunity, notes Tellez, for her to educate the reporters about just how many cyclists are regularly killed on the road, something she felt they are still only just beginning to understand. But, for all the attention to and education around the problem, the carnage continues. Just last night, a 19-year-old man was killed in a horrific hit-and-run in Watts. Jerry Arredondo had stopped by a friend’s place on 105th and was crossing the otherwise quiet street when a (possibly drunk) driver came screaming down the block at between 80 and 100 mph, hit a dip in the road, went airborne, and slammed into him, apparently launching Arredondo 20 ft. into the air and 40 ft. forward. The car then continued on down the street, smashing into seven other parked cars, finally stopping after losing a wheel. The driver then got out of the destroyed rental car and into a BMW, apparently driven by an acquaintance who thought it prudent to help the first driver get away from the mayhem he had just created. A search is currently underway for both drivers. Even when drivers are found, the wheels of justice turn very slowly, as Garcia’s family can attest. His parents had traveled all the way from Texas just to see the pre-trial hearing rescheduled for March 6. New evidence was entered which needed to be reviewed by both parties. 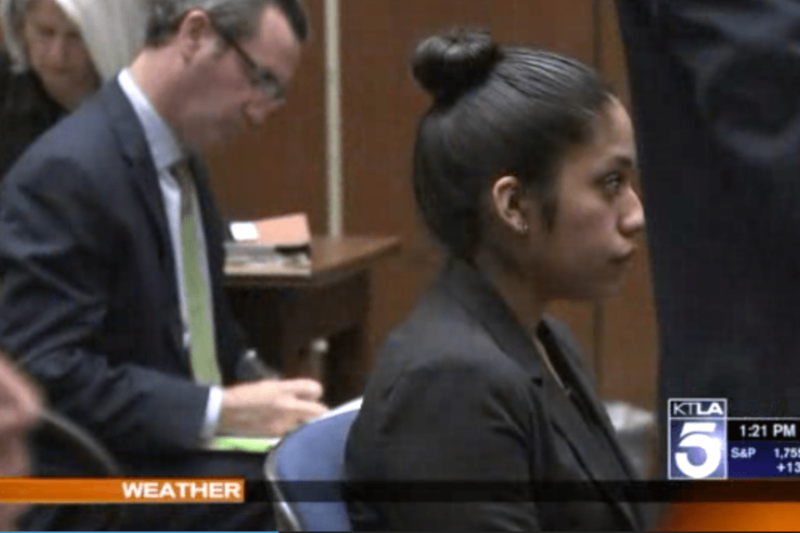 Meanwhile, Villegas (pictured above) continues to walk free, attending AA meetings and (reluctantly) wearing an ankle bracelet to monitor her movement and alcohol intake. Disheartened by the slow nature of the process, Garcia’s family did the only thing they could do to help themselves move toward closure: they rode to what his mother calls “Andy’s Bridge” — the site on Cesar Chavez where he was hit — to pay their respects one more time with his friends before heading back to the airport. It’s no easier on the friends who witnessed the incident, who still have residual pain, continue to be haunted by what they saw, and feel helpless to alleviate the sadness of Garcia’s grieving family. Tellez says she is grateful for the love and support Andy’s friends have shown them. But all the love and support in the world is unable to bring Andy, or any of the other victims, back. The best they can hope for is that people will take more care on the roads and that the law will work in their favor. *To keep up with Andy’s case, click here. **To learn more about Ghost Bikes and the documentary activists Danny Gamboa and Kat Jarvis are working on, click here. ***Los Ryderz put out word they will be hosting a car wash this weekend (Feb. 8) to support the family of Jerry Arredondo. One of their riders was good friends with him and their home base at YO Watts is just a few blocks away from the scene of the crash. The car wash is still being organized, so we don’t have details as yet, but you can keep up with Los Ryderz here. Public Safety Committee Acknowledges the Hit and Run Crisis, LAPD Not So Much.